TRIVIA of Noh : Q26 : Which play has the most actors? | Home | Trivia | Q26 : Which play has the most actors? Which play has the most actors? Noh plays can have either just two performers on stage or a number of performers. One particularly interesting aspect of Noh comes from appreciating how each play uses the space on the stage. It is difficult to determine which piece has the most performers appearing on stage since many pieces require a large number of performers. In addition, the number of performers differs among schools even for the same piece. One of the prominent plays among these is “Ataka.” In addition to “Benkei” (shite: lead part), “Togashi” (waki: supporting cast), “Yoshitsune” (kokata: juvenile actor), “Gōriki” (omoai: interluding cast member), “Tachimochi” (adoai: interluding cast member), eight to ten performers appear on stage as Yoshitsune’s retainers (tsure: the companion of shite). Having thirteen to fifteen actors lined up on stage is spectacular. 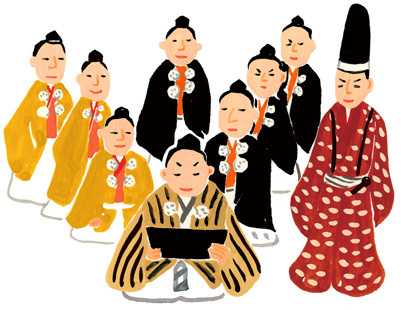 Two other Genzai-noh stories, “Eboshiori” and “Shōzon,” are representative of pieces in which more than ten actors take the stage. In both plays, a number of performers act out fanciful sword fighting. These pieces show us one of the charms of Noh dramas, which is somehow unrelated to the subtleness and profoundness. Another example of a piece with many performers is “Kurama-tengu.” Many kokata in the first half of the drama create a unique and gorgeous atmosphere.